Easy to Apply. Designed to Seal. High Viscosity Tissue Adhesive Like No Other! As applied to skin, Exofin® is syrup-like in viscosity and polymerizes quickly—less than one minute. It is a sterile, topical adhesive that contains a monomeric (2-octyl cyanoacrylate) formulation and the colorant D & C Violet #2 which allows the user to easily see where the adhesive has been applied. 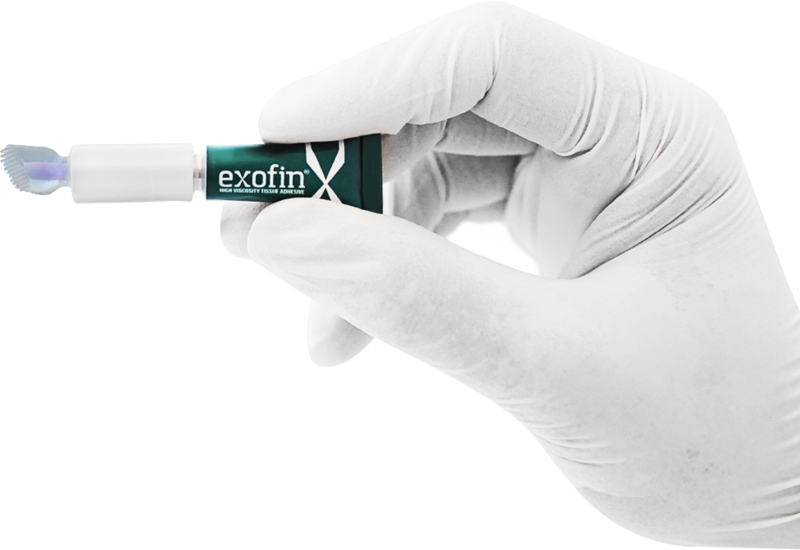 The increased viscosity of Exofin® is formulated to reduce the risk of unintended placement of the adhesive during application due to migration of the liquid adhesive from the wound site. 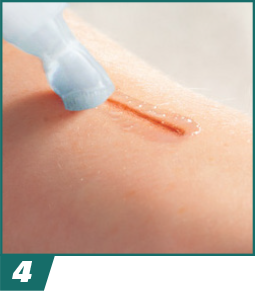 The incision or trauma site must be clean and dry before applying adhesive. Ensure that the wound edges are easily approximated. Tighten the pre-assembled Applicator Tip onto the threaded tube in a clockwise direction until the applicator is tight and seated on the tube. The applicator will puncture the foil membrane on the tube once seated and adhesive will be allowed to flow. 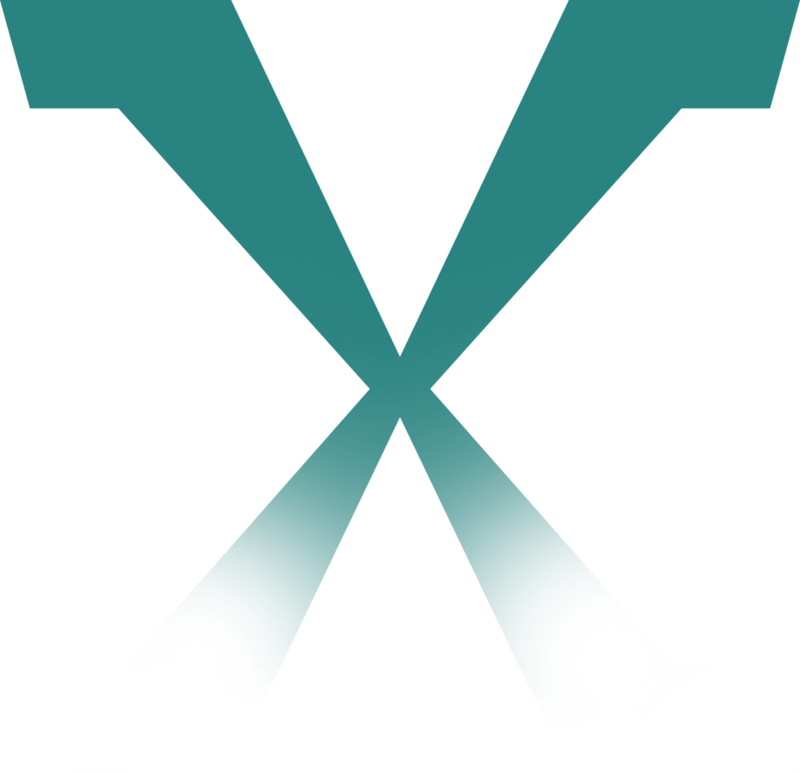 While holding the tube in a horizontal position, begin squeezing at the bottom of the tube at the “X”. Continue to move the glue up the tube until it appears in the clear applicator tip. 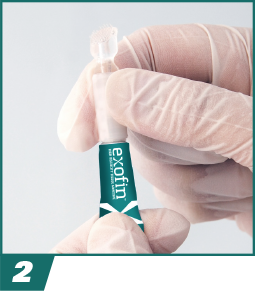 Immediately begin to apply exofin® to the wound site. Continue moving the adhesive up the tube while brushing in a back and forth motion “painting the surface” until completely covered. If additional sites require adhesive, move to those sites and repeat. The adhesive should be tack free approximately 30 seconds after application, but is dependent upon the thickness of the adhesive layer. Care should be taken to create a smooth even layer of adhesive to prevent thick edges which may lead to inadvertent bond breakage of the adhesive. Once adhesive has completely polymerized (non-tacky) you may cover the site with a secondary bandage. If a secondary bandage is used, DO NOT apply to the adhesive area until it is completely tack free. Applying while tacky may result in adhesive removal when removing secondary bandage and possibly dehiscence of the wound site. Discard adhesive device according to normal protocol after use. contact your Chemence Medical Customer Support Representative at 844-633-4583 .